The Grover Dual Triangle Mount allows you to mount your triangles from any standard cymbal stand. The versatile side-arm extension enables you to mount two triangles (from 4" to 10") in a vertical or one triangle in a horizontal configuration. The exclusive "nodal" suspension system allows maximum resonance from your triangles. Completely adjustable, the Grover DTM is the perfect accessory for orchestral, solo or multi-percussion use. 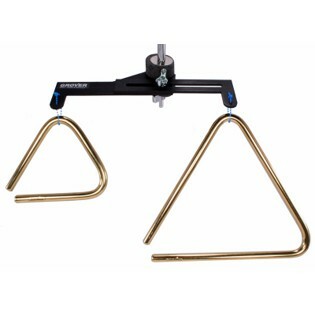 This is a pretty good triangle mount at a good price. It works well on a cymbal stand and adjusts so that you can put two triangles on it side by side or one triangle in a horizontal position so that you can play it with two beaters. The only problem I see is that in that horizontal position, the triangle is so close to the mount, it is hard to play it on the top without hitting the mount. I may replace the nylon loops so that it hangs a little lower, but I hate too because these are really good loops that look strong and secure. A small thing, but something to consider. A great thing for show playing. This is a handy device that I use frequently in show playing and pops programming. It's great for having a 4" and 6" triangle mounted close by in a tight setup and I frequently use it in conjunction with a cymbal stacker or other accessory mount so I can have the triangles and other instruments together on one stand. Purchased one at PASIC. I use it ALL the time in orchestra and especially for playing contemporary percussion lit. The feature that lets you hang 1 triangle horizonally is worth the price alone!